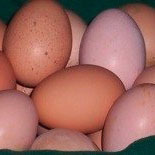 There is nothing like the taste of fresh eggs from happy hens. You’ll be able to tell the difference. All of our eggs are from cage-free or free-range chickens. We have partnered with local farms to supply our eggs and can vouch that the hens are well cared for, and never subjected to inhumane factory farming techniques.